Francis Jeffrey was a Scottish judge and literary critic. He was born in Edinburgh, the son of George Jeffrey, a clerk in the Court of Session. 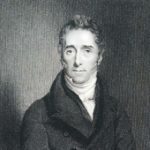 After attending the Royal High School for six years, he studied at the University of Glasgow from 1787 to May 1789, and at Queen’s College, Oxford, from September 1791 to June 1792. "There is nothing respecting which a man may be so long unconscious as of the extent and strength of his prejudices."